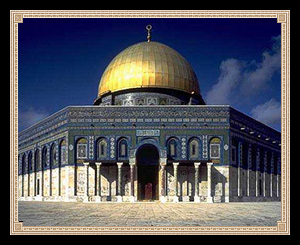 Erected between AD 685 and 691 on orders the Abd al-Malik ibn Marwan, the Dome of the Rock is said to have cost seven times the revenue of Egypt was to build. The Dome is in the shaped like a Byzantine martyrium and covered in 100, 000 dinar of gold. This wonder is unfortunately a pilgrimage site for the islamic faith, perhaps it should be destroyed? While happy to have this wonderous site within their city, and merchants are happy with the wealth from pilgrims, the influx of people places quiet a demand on facilities.